Content: : : So are you German? I'm basically German! My Mom goes to Germany a couple times a year. Is that place near Berlin? : I live in Freiburg. That's about as far from Berlin as you can get in Germany. Berlin is (more or less) in the north-east corner, Freiburg in the south-west. : : Yes, thats my goal. So think its been good that I got injured because I've been watching tons of videos to "get it." : : : : I really LOVE skating!! : Yes, rolling is really addictive. When you really do get around to building your own skates, don't forget to post a foto. Heck, you can also post a foto of your current set-up! : : I really love the pictures of the vert skaters, but those dont so much teach me how to react on the ramps if you understand what I'm saying. : That's right. This site has next to nothing to offer with regard on how to do it. Maybe you can learn a bit from the videos. Surely you can learn something by asking the people here on the forum. Best would be to meet in person, but that's a rare opportunity because we are dispersed so widely. : : But right now I need to stop fearing falling after the last time. I sit at my job all day and that wasnt fun. : Ouch. I feel what you mean. Speedy recovery! I'm pretty much healed! So I'm very happy and back to the skatepark. Still not to the point where I can go vertical yet on the ramps so I might ask about that but I think like most things, its just time and practice. 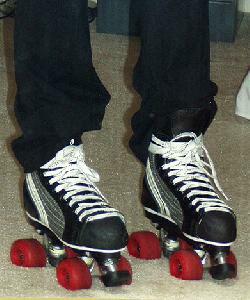 Here are my skates. I dont have wide trucks yet and need better wheels but I'm not sure what type yet. Tried some aggressive inlines today and they were quite bumpy and not nearly as stable. I think the larger wheels work better. I guess if I get ramp trucks they would work OK, but not sure if I'm ready for ramp trucks yet.